Chirk Court in Chirk won the ‘Care and Nursing Home Community Plus Award at the annual meeting of Clwyd Alyn Housing Association recently. More than 200 residents, staff members and guests from partner organisations from across North and Mid Wales attended the AGM where awards were presented to individuals and to schemes that have made a great contribution to their local community areas. The awards were part of a celebration to mark the 40th anniversary of Clwyd Alyn showing how it has grown from employing 2 staff in 1978 to becoming an important part of the Welsh economy, providing vital services employing 700 people with an annual turnover of more than £40 million a year. 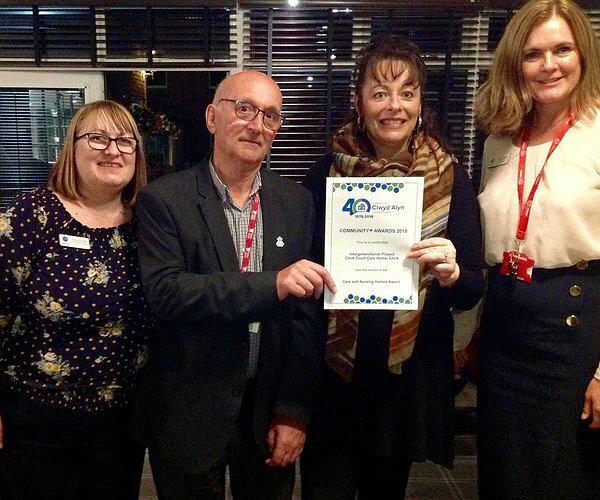 Chirk Court was nominated for the award by local Town and Community Councillor Frank Hemmings who is the local Dementia Champion within the Chirk. Tributes were also paid to staff at the home and links made with both the local community and with external partners who help provide a wide range of stimulating activities at the home for residents to enjoy. Residents from the Rosehill area of Brynteg, Wrexham were also recognized, winning the General Housing Award for the Maes Eithin Community Event helping to bring the community together with an educational and recreational trip to the Welsh Mountain Zoo. Awards were presented by Mrs Eurwen Edwards, OBE, Hon. President and Founder Member of Clwyd Alyn, along with Louise Blackwell, Community Development Officer. "Community Awards for Flintshire Schemes"